Copyright 2010 Analytical Pipeline Solutions: Pipeline Cleaning. All Rights Reserved. The most cost effective way to clean your pipeline is while it is in service, which enables you to continue delivering product to your customers, without degrading product quality. This is the niche that we at Analytical Pipeline Services have brought to the pipeline industry. 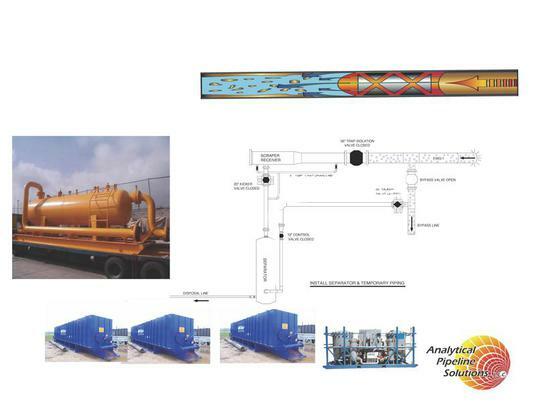 With the use of a pipeline pig and advanced chemical technology, the abrasive and tacky debris is removed from the pipeline's inner surfaces as a slurry, which is easily transferred from the pipeline. With specially designed portable separators, we remove abrasive and tacky debris from the pipeline systems without shutting it down. This is a huge cost saver for the customer as compared to taking the line out of service, as required by most other pipeline inspection and cleaning companies. With the use of our advanced chemicals, sludge in crude oil or bunker-c tanks can be converted to a pump able product that can be removed easily and converted back to a usable product, thereby reducing disposal cost. This product can be applied with the use of butterworth nozzles or mixing blades. As the chemical is circulated with the sludge, the heavy particles settle out in a settling tank or with a centrifuge. After the sludge has been removed, the washing with a water soluble product leaves the floor of the tank hydrocarbon free, now allowing MFL inspection to be done without sensor lift off and hot work to be performed in a safe and easy manor. For more information about pipeline inspection or cleaning, please contact us at Analytical Pipeline Solutions.